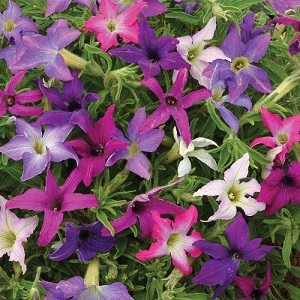 The first star-shaped Petunia with masses of flowers from June to October. Petunias are ideal for containers and hanging baskets. They grow to a height of 30cm and spread out 35cm and make a lovely all-summer display. Petunias grow best in full sun and regular compost. Deadhead the flowers, and feed and water the plants regularly for the best display. Pack of 50 seeds. Sow in spring (February to April). Sowing instructions and a colour photo are printed on the packet. Sow in spring (February to April). Sow the seeds in a tray or small pots of compost. Press the seeds gently into the compost and cover lightly with compost. Do not exclude light which helps germination. Germination takes 2-3 weeks at a warm 21-25°C. Transplant seedlings into pots when they are big enough to handle and out into the garden after the last frost. Deadhead plants to encourage more flowers. Feed and water container plants regularly for the best display. Remove plants in autumn once they have finished flowering.